Singapore Freebies: Esplanade Mall: Enjoy Special 1-for-1 Lunchtime Deals!! Esplanade Mall: Enjoy Special 1-for-1 Lunchtime Deals!! 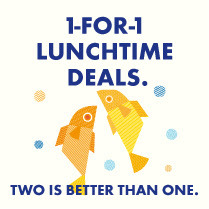 enjoy Esplanade Mall’s 1-for-1 lunchtime deals when you use your Visa card! Also, 1-for-1 Visa customers get to enjoy free parking for the first three hours between 12pm – 5pm. Redeem your complimentary parking coupons at the Concert Hall Information Counter (Concourse, Level 1) with your 1-for-1 receipt by 5.30pm on the same day. Limited to one coupon per receipt under $30. Payment must be made with your Visa card. Timing of lunch hours may vary across outlets. Not applicable with other promotions, discounts, vouchers and other offers by credit or privilege cards. Prices indicated are subjected to service charge and prevailing government tax. Esplanade Mall and participating tenants reserve the right to amend the promotion and terms and conditions without prior notice.